TV judge and former prosecutor Jeanine Pirro is breaking down what the court will have to consider in the custody battle over Michael Jackson's eldest children, Prince Michael and Paris. 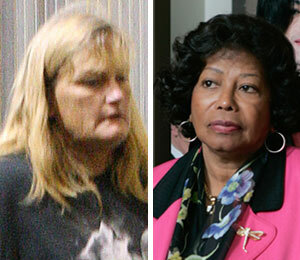 Judge Pirro tells "Extra," "If there's going to be a battle, it will be between the grandma Katherine and Debbie Rowe." Michael Jackson's will named his mother Katherine as the guardian of all three children. Debbie Rowe surrendered her parental rights in 2001 and received a secret settlement believed to be around $750,000 a year. Rowe late rfought to have her rights restored but they never were. Pirro says, "She tried to give up parental rights," adding, "That plays very big in a judge's eyes." On Thursday, Rowe told NBC4, "I want my children." Questions remain as to whether Rowe is actually the biological mother of Prince and Paris, or if she was just a surrogate. The 50-year-old is reportedly willing to take a DNA test and if she's the biological mom, Rowe has legal claim in the state of California. Pirro explains, "Jackson was married to Debbie when she had the children. That gives him superior rights even though he might not be the biological father." Earlier this week, Los Angeles dermatologist Dr. Arnold Klein was brought into the equation. Us Weekly claims the doc is the biological father of 12-year-old Prince and 11-year-old Paris, not Jackson. Pirro tells "Extra" if Michael wasn't the biological father, "he has some rights" because he was married to Rowe when she had the children. She states the court will rule "in the best interest of the children." "Extra" wants to know: Who do you think should get custody?